Even as Clydesdales go, Poe is unusual. 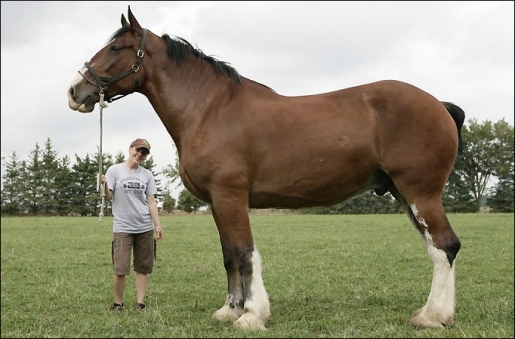 A rescue animal taken in by Shereen Thompson from Ontario, Canada, the 20.2 hands high beast just might be the world’s largest horse. His measured 20.2 hands works out to be nearly 81 inches tall, which means that Poe stands a robust 6 feet 8 inches tall, rounding up slightly. That’s just the height from the bottom of his foot to his shoulder, that’s not even climbing all the way to his head! Now the World’s Tallest Man won’t need to buy a car after all! He can just take Poe for a ride and get to where he needs to go the natural way. Apparently, part of my family legacy is that, in the old days, a cousin was one of the foremost breeders of giant mules in the state, and that people came from hundreds of miles away just to purchase his work animals. No matter how big a mule can get, there’s nothing that can compare to the size and power of the iconic Clydesdale, though! I can’t even begin to guess the size of hinny a beast like Poe could sire.